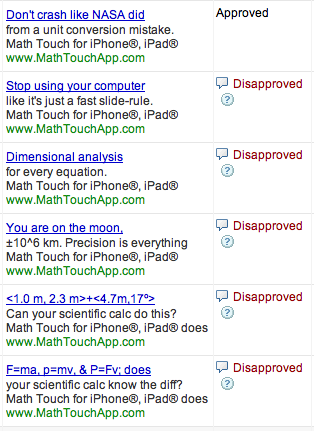 I know some of y’all heard about Math Touch from Google, because I can see you clicking through. Once you’ve found it, please bookmark me and tell your friends (’cause I pay for every time you click the ad). I’m glad y’all are getting through, but my best ads haven’t even been approved — the ones that tell you the app is for iPhone and iPad. Here are some of them. Personally I think they’re hilarious and quite to the point, but Google says they contain a “trademark term” so they are disapproved. Why did they approve that first one? Chalk it up to corporate bureaucracy.